Wesley Clarence McFaul was born on March 27, 1891, to Alexander and Annie (née Roadhouse) McFaul, in Owen Sound, Ontario. He was their second son, with his older brother William Lawrence having just turned two (being born in 1889). In time, three more children would be born to Alex and Annie: Lillian Viola (1894), Charlotte Evelyn (1895), and Robert Cecil (1897). School started for Clarence (he was better known by his middle name) around 1896, and he attended Dufferin Elementary in Owen Sound along with his brothers and sisters. During this time, he and his family lived in the large stone house at 1074 6th Avenue West, Owen Sound: a building which still stands to this day. In 1905, Clarence began classes at the Owen Sound Collegiate Institute (OSCI), and historical documents show that he had an almost perfect attendance record. In the 1919 edition of the OSCI Auditorium - published after his graduation - Clarence and his brother's names can be found in school's Roll of Honor (on pages 5 and 6 respectively). Clarence McFaul was an active member of the Methodist church community in Owen Sound. A 1908 photograph shows him in a YMCA Bible study class, and his obituary described him as "upright, [and] God fearing." Clarence's mother, Annie, passed away in January of 1914, of a combination of uterine cancer and bronchitis. At this time, the McFaul family was living at 922 2nd Avenue West in Owen Sound, having moved there at some point after 1911. They also owned a store at 912 2nd Avenue East - a main street grocery shop known as McFaul's. Clarence was working there as a clerk when, in November of 1915, he enlisted in Peterborough, Ontario to fight in the Great War. Originally a member of the 31st Grey Regiment, Clarence McFaul was assigned to the 93rd Overseas Battalion, C.E.F. He, along with hundreds of other young Canadian men, embarked from Halifax aboard the S.S. Empress of Britain on July 15, 1916.. They would arrive in Liverpool ten days later, on July 25, 1916. From there, Clarence would be transferred to the 19th Battalion. Clarence was wounded in battle on August 18, 1918, receiving a gunshot wound the the right arm. Two days after the incident, he was admitted to the Order of the Daughters of the Empire Hospital (located at Hyde Park, in London), where he spent several weeks. After that, he was sent to the Officers' Convalescent Hospital (Matlock Bath, England), where he remained from September 19, 1918 to his discharge date of September 25, 1918. According to War Diary data recorded for the Matlock Bath hospital, the Thursday Clarence arrived was a "pleasant day." The local paper in Clarence McFaul's hometown heard news of the injury the young Lieutenant had received, and shortly after the incident published a brief article (circa. 1918). 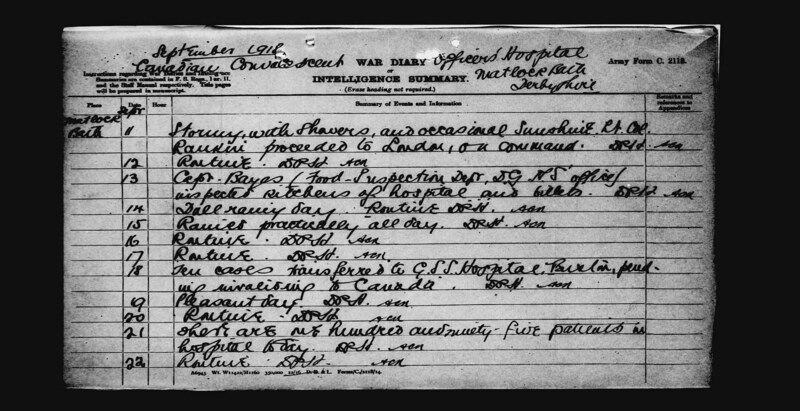 "Mr. A. W. McFaul, 922, 2nd Ave W., received word from the records office this morning that his son, Lieut. Wesley Clarence McFaul, had been admitted into No. 8, General Hospital, Rouen, suffering from gunshot wounds in the right arm. Lieut. McFaul enlisted with the 93rd battalion from Peterboro' [sic] as a private and went overseas with that unit. Going to France about two years ago he was transferred into the 19th Battalion and last winter was sent to England to take out a commission. He received his commission last March and since that time has been with his battalion. Lieut. McFaul has two brothers also overseas, Pte. Cecil McFaul with the 1st Canadian Tank Battalion and Lieut. Lawrence McFaul with the Royal Canadian Engineers." "He was standing in the garden of a house in Hyon about 2:30 p.m. on November 10th, 1918, when a shell exploded at his feet, wounding him in the leg and right shoulder. He was rendered unconscious and died about five minutes after being hit." Armistice was declared the next day - November 11, 1918. Lieutenant Charles Mitchell (who later married Clarence's sister, Evelyn) recounted the end of the war. "This chap, Clarence McFaul, he and I chummed together and I married his sister after I came back. Well, I'd just got word that he'd been killed and it was very sad. You lose your best pal and you didn't feel like celebrating. There was something about it that morning. It wasn't jubilant to me." Clarence was buried in the Mons Communal Cemetery Extension in Mons, Hainhaut, Belgium. His father also arranged to have a grave marker made in Greenwood Cemetery in Owen Sound, Ontario, as part of the family plot. "Mr. A.W. McFaul, 922 2nd Ave. W., received a telegram on Sunday containing the sad announcement that his son, Lieut. Wesley Clarence McFaul, Infantry, had been killed in action on the previous Sunday, Nov. 10th. The word, coming after the signing of the armistice, when everyone hoped that casualties had ceased, made the announcement doubly hard. The late Lieut. McFaul enlisted in November, 1915, with the 93rd Battalion and was in France in July, 1916. He served with such distinction that he was awarded a military medal and a commission. He was wounded in August last and had only returned to the front thirteen days when he made the great sacrifice. One day more and the fighting had ceased. Lieut. McFaul was not only well known but vry [sic] highly esteemed by everyone who knew him. He was an upright, God fearing, and manly man and his death has caused the deepest regret. He was a member and constant worker in the Westside Methodist Church. He leaves, besides his father, two sisters, Misses Evelyn and Violet, at home, and two soldier brothers, Lt. Lawrence and Pte. Cecil McFaul, both of whom are in France. To the relatives the sincerest sympathy is extended in their bereavement." Public School Daily Register for Recording the Attendance of Pupils. 1896. Attendance records for 1896 for Dufferin Elementary School. Dufferin Elementary School, Owen Sound. Dawkin, W. J. High School Register of Daily Attendance: Form I.B. Jan. 1905. Attendance records from January 1905 to December 1905 for the O.S.C.I. Owen Sound & Collegiate Institute, Owen Sound. "Clarence McFaul Killed in Action on November 10." The Owen Sound Sun Times 19 Nov. 1918: 1. Print. "War Diary - Officers' Convalescent Hospital - Matlock Bath." War Diaries of the First World War. Library and Archives Canada, n.d. Web. <http://data2.collectionscanada.ca/e/e061/e001524276.jpg>. Government of Canada. Circumstances of Death for Lieutenant Wesley Clarence McFaul. H.Q. File Number 649-M-15203. November 10, 1918. Above: A 1908 YMCA Bible study class from Owen Sound, Ontario.